Lived c. 1560 – 1621. Thomas Harriot was a polymath – a mathematician, astronomer, physicist, navigator, and linguist. He traveled to the New World in 1585, where he translated the Algonquian language into English. 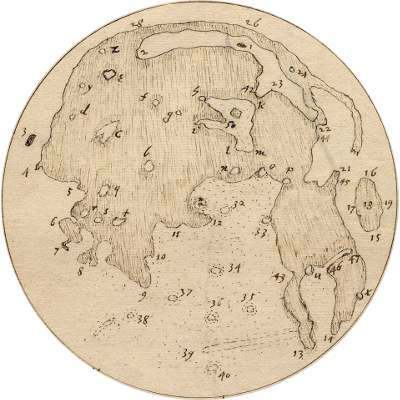 A contemporary of Galileo Galilei and Johannes Kepler, Harriot was the first person in history to draw a heavenly body after observing it with a telescope, drawing a map of the moon in July 1609. He was probably the first person in history to record sun spots with a telescope, allowing him to deduce the sun’s rate of rotation. Harriot did not publish any of his scientific work, although he did correspond with leading scientists of the time including Johannes Kepler. Harriot’s scientific papers were discovered after his death. These included the materials for a mathematics book, The Practice of the Analytical Art. Published 10 years after Harriot’s death, this book transformed algebra, replacing word equations with a clearer, more concise presentation style based on mathematical symbols. Thomas Harriot was born in the county of Oxfordshire, England in about 1560, the son of a commoner. At the age of 17, in 1577, he registered for classes at the University of Oxford, where he studied for three years, graduating with a Bachelor of Arts degree in 1580. After graduating, Harriot moved to London. 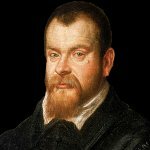 He was a highly talented mathematician/astronomer, and his abilities came to the attention of Walter Raleigh, the famous explorer. In 1583, Raleigh hired Harriot at a generous salary and utilized his skills to assist in ship design, navigation, and as a treasurer. Harriot lived in Raleigh’s home for a time, teaching Raleigh mathematics and lecturing to Raleigh’s ships’ officers about mathematics and navigation. 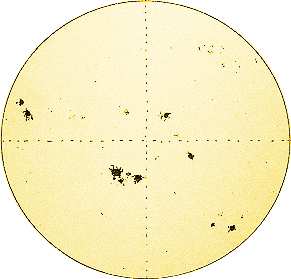 In a lost work, Arcticon, Harriot described new navigational methods utilizing solar and pole star observations to determine latitude, and other advances in observational methods. Harriot’s work provided Raleigh with the best methods of navigation in Europe. Raleigh introduced Harriot to two Native Americans who had come to England, Manteo and Wanchese. From them, Harriot learned the Algonquian language and recorded it using his own phonetic alphabet. He also learned about conditions in the New World; Harriot’s information helped settlers prepare for life there. In 1585, Harriot sailed to North America on an expedition funded by Raleigh. He lived for about a year on Roanoke Island off the coast of North Carolina, where he became more fluent in the Algonquian language, translating it for other members of the expedition. The Algonquians introduced Harriot to their habit of smoking tobacco in pipes, which he later promoted enthusiastically in England. In 1588, Harriot described the New World in A briefe and true report of the new found land of Virginia. 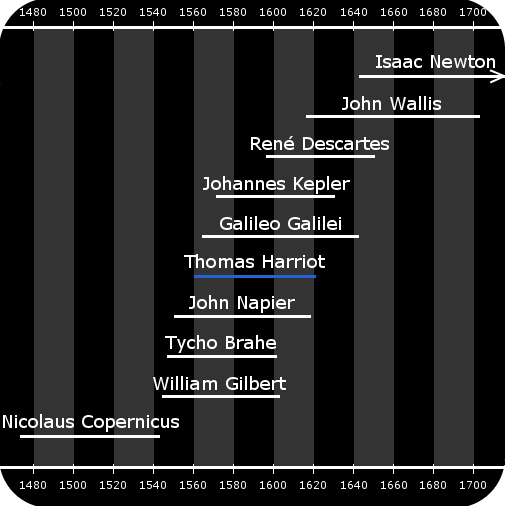 Harriot’s lifetime and the lifetimes of related scientists and mathematicians. Harriot never formally published any of his scientific work. Scientists he knew personally or by correspondence learned about some of his discoveries. In about 1590, Harriot began associating with the Earl of Northumberland, a wealthy nobleman who was interested in science. In the mid-1590s, the Earl began funding Harriot’s work and provided him with space to live and work in Syon House, his stately home. The Earl of Northumberland’s Syon House in London, where Harriot lived and worked from 1598 until his death in 1621. In 1601, Harriot discovered the sine law of light refraction, now called Snell’s Law. Willebrord Snell discovered the same law in 1621, and it was finally published by Descartes in 1637. Harriot did not publish his work, although he corresponded with Johannes Kepler about it. The sine law of light refraction was first discovered by Ibn Sahl in Baghdad in about 984. Harriot studied projectile motion on behalf of Walter Raleigh, who was interested in aiming ships’ cannons accurately. By 1607, Harriot had concluded correctly that the basic shape of a cannonball’s flight is a parabola with gravity acting vertically and air resistance acting throughout the ball’s motion. In doing so, he refuted Aristotle’s belief that air sustained motion. However, unlike Galileo, Harriot could not break with Aristotle’s false doctrine that the heavier a thing is, the faster it falls. 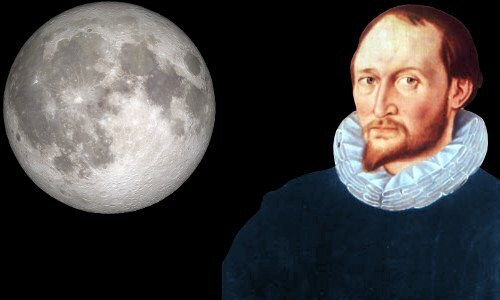 On July 26, 1609, Harriot was the first person in history to study the moon using a telescope, drawing what he saw. One of Harriot’s drawings of the moon, probably from 1609, recording the dark ‘seas’ and a number of craters. In 1610, Harriot used one of his telescopes to observe sunspots independently of Galileo. Harriot made close to 200 observations of sunspots between December 1610 and January 1613, utilizing his observations to calculate the rate at which the sun spins on its axis. One of Harriot’s drawings of sunspots from 1609. Harriot’s Artis Analyticae Praxis, (The Practice of the Analytical Art) was a masterly algebraic work concerned with the solution and theory of equations, casting algebra entirely in symbolic language for the first time. The use of symbols rather than lengthy word equations brought a decisive new clarity to algebra, accelerating its development. The book was published 10 years after Harriot’s death. Unfortunately, the book’s publishers did not understand the work and removed significant sections of it, including Harriot’s solutions of equations that yielded negative and complex roots. The full extent of Harriot’s genius will never be known, because many of the papers he wrote were lost. Harriot was associated with a number of people suspected of involvement in the Gunpowder Plot of 1605 to blow up Parliament and kill James Stuart, the King of England and Scotland. Harriot was held in prison for a short time, but no further action was taken against him. His patron, the Earl of Northumberland, was imprisoned for 17 years, in some comfort, in the Tower of London. Harriot was present in 1618 to witness the public execution for treason, which most people believed was unjust, of his old friend Walter Raleigh. Thomas Harriot died aged 60 or 61 on July 2, 1621. For the final six years of his life he had suffered from painful cancerous ulcers on his lips, which spread to his nose. It seems probable that he died from skin cancer. Harriot never married and had no children. He was buried in St Catherine’s Church in London. The church and a monument erected in honor of Harriot were destroyed in the great fire that swept through London in 1666. Today, the Bank of England is located on the site once occupied by St Catherine’s Church. Images digitally enhanced by this website. "Thomas Harriot." Famous Scientists. famousscientists.org. 19 Apr. 2017. Web.